This was one mean cat and you had to be very careful as she would try to swipe anyone who stayed too near to the bars. I wouldn’t fancy meeting her in a South American jungle. "WHF, The Big Cat Sanctuary has one Jaguar, a melanistic female called Athena. She was born in Croatia at a collection called Zagreb Zoo and remained there for three years. At 3 years old she moved to Paradise Wildlife Park (PWP) where she lived for a further 5 years until coming to live with us. While at PWP she was frequently mixed with a male for breeding purposes, but this never resulted in a pregnancy. She is missing the tips of both ears and has had extensive surgery on her left front paw and face from unsuccessful introductions to the male. Athena is a very intelligent cat and will often test every inch of the enclosure. She knows where ‘weaker’ areas are and how to try and convince people to move closer to the mesh! Athena is known to carry out ‘mock seizures/fits’ in order to get people into her enclosure and also holding her breath immediately after being darted for dental treatment. Athena although being captive born still displays very similar behaviour to that shown in wild animals. She is very silent on foot, having a stride length of approximately half a meter and will often stalk guests, keepers and photographers. Activity is usually more common early afternoon and into the evening. This is encouraged by carrying out enrichment feeds. Boxes are very popular as they can be bitten and dragged around the enclosure similar to a carcass. Food items can also be suspended to encourage climbing activity and improve overall fitness. We also use a variety of synthetic smells and herbs which allow the cat to come into contact with unfamiliar scents as they would in the wild. Jaguars are the largest cat species found within South America. As with the majority of the big cats they are solitary and only really socialize with others for breeding purposes. There are slight variations in the colour of the coat with black individuals being relatively common. 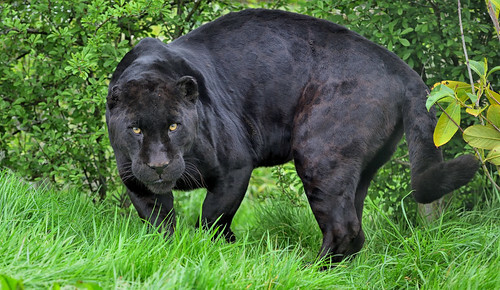 These all black cats are often incorrectly referred to as black panthers. The coat colouration is very similar to that of a leopard, but there is a difference in the rosettes which in the jaguar have a small black dots in the centre. Jaguar are also much more heavily built than the leopard with a longer face and much more prominent sagittal crest, giving the head a distinctly pointed top. Unlike many of the other cat species Jaguar are not adverse to water and are actually very good swimmers. American flamingos are unmistakable birds with a curiously shaped bill, slender necks and long, delicate looking legs. Their brilliant feathers range from a pale pink to scarlet red, with bright pink being the most common. Although they may appear strange, each feature on the flamingo serves an important function. Their long legs and necks allow the birds to wade and forage in water several feet deep. Their oddly shaped bill is perfectly suited to strain plankton and other small invertebrates from the water. The microscopic shrimp and algae in their diet is also the source of their iconic pink color – the pigment is deposited in their feathers as they grow and the brightness of the color indicates how well the flamingo was eating as the feathers were growing. This may be a sign to other flamingos of an individual’s fitness. American flamingos’ long legs appear as though their knees bend backwards, which is not the case. Flamingos actually stand on their “tip-toes” – meaning the prominent joint on their leg is their ankle! Their knee is hidden by feathers and is located close to the bird’s body. The American flamingo (Phoenicopterus ruber) is a large species of flamingo closely related to the greater flamingo and Chilean flamingo. It was formerly considered conspecific with the greater flamingo, but that treatment is now widely viewed (e.g. by the American and British Ornithologists’ Unions) as incorrect due to a lack of evidence. 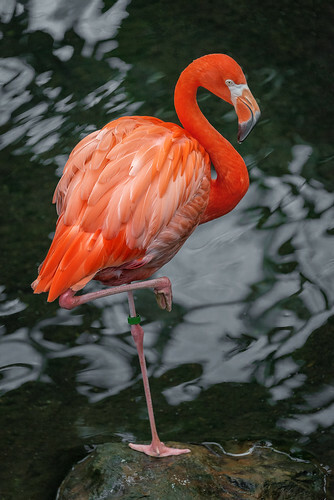 It is also known as the Caribbean flamingo although it is present in the Galápagos Islands. In Cuba it is also known as the greater flamingo. It is the only flamingo that naturally inhabits North America. The National Aviary, located in Pittsburgh, Pennsylvania, is the only independent indoor nonprofit aviary in the United States. It is also the country’s largest aviary, and the only accorded honorary "National" status by the United States Congress. The aviary is home to over 500 birds representing more than 150 species, and is a member of the Association of Zoos and Aquariums (AZA).